Loss of control – a reason for fear of birth ? When any of us are admitted to hospital we lose control . We are unable to get a hot drink when we want one , eat what we want when we want to ,take simple pain relief , go to the toilet , sleep as well as we would at home , get up in the night or stay in bed longer . We are also unable to control what we hear , what we see . We lose our safe place of home and being surrounded by friends and family – it feels lonely and alien to us . This doesn’t mean that we are not able to adapt to new situations it’s just that more than a few things change and this throws a curveball towards us . 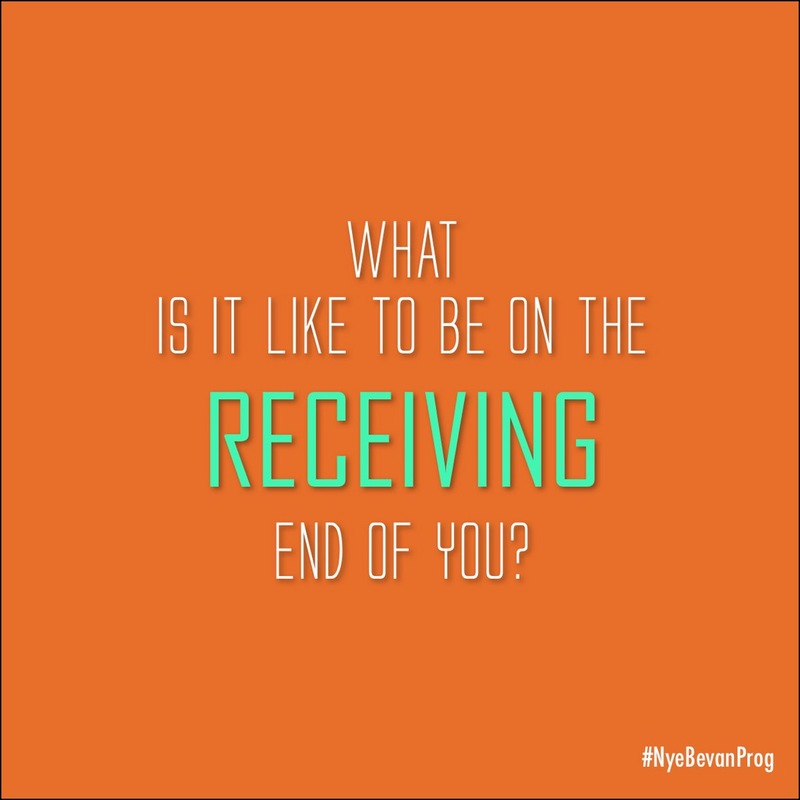 The fear we feel is because we feel we are handing ourselves and our bodies , our routines and home comforts over to others, they are dismissed – this has quite a destabilising effect on our psyche . I have copied and pasted the exact words and written the key words in CAPITALS below to help highlight their impact – does it make you think about them differently ? 1.2.1 Treat ALL women in labour with RESPECT . Ensure that the woman is in CONTROL of and involved in what is happening to her, and recognise that the way in which care is given is key to this. To FACILITATE this, ESTABLISH a RAPPORT with the woman, ASK her about her WANTS and EXPECTATIONS for labour, and be AWARE of the importance of TONE and DEMEANOUR , and of the ACTUAL WORDS used. Use this information to SUPPORT and GUIDE her through her labour. explain your ROLE in her CARE . Maintain a CALM and CONFIDENT approach so that your demeanour REASSURES the woman that all is going well. KNOCK and WAIT before entering the WOMAN’S ROOM , respecting it as her PERSONAL SPACE , and ask others to do the same. ASK how the woman is FEELING and whether there is anything in particular she is WORRIED about. If the woman has a written BIRTH PLAN , READ and DISCUSS it with her. ASSESS the woman’s KNOWLEDGE of strategies for coping with pain –PROVIDE BALANCED INFORMATION to find out which available approaches are ACCEPTABLE to her. ENCOURAGE the woman to ADAPT to the environment to meet her INDIVIDUAL needs. Ask her PERMISSION before all PROCEDURES and OBSERVATIONS, FOCUSING on the WOMAN rather than the TECHNOLOGY or the DOCUMENTATION . 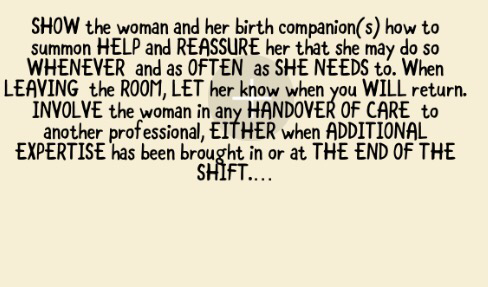 SHOW the woman and her birth companion(s) how to summon HELP and REASSURE her that she may do so WHENEVER and as OFTEN as SHE NEEDS to. When LEAVING the ROOM, LET her know when you WILL return. INVOLVE the woman in any HANDOVER OF CARE to another professional, EITHER when ADDITIONAL EXPERTISE has been brought in or at THE END OF THE SHIFT. 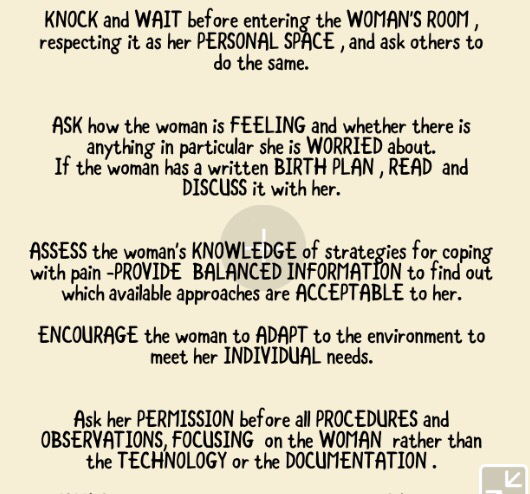 Every person who cares for (no matter how short a time ) a woman in labour should follow this guidance and I feel there should be posters up on maternity units in all languages which emphasise that this will happen . There are many barriers to communication and one that most midwives, student midwives , maternity health care assistants , obstetricians and anaesthetists agree on is that time, pressure and NHS systems restricts our practice. I want to have laminated cards that go with the analgesia cards to explain why kindness and compassion will also help ease women’s pain . Fear is a huge factor in the perception of pain and if we try to reduce fear we might help reduce not only pain but also anxiety and then by this we will gain trust and build on positive care. As the midwifery workforce we must start to say to ourselves “how would I feel ? ” another question which is used on the Nye Bevan leadership module is this …. Lets keep sharing our ideas and thoughts and if you have any more relating to CG190 – tweet using #CG190 or why not write a blog or design a poster ? Thank you for reading and please leave comments , I always value them and they help me to reflect and grow . 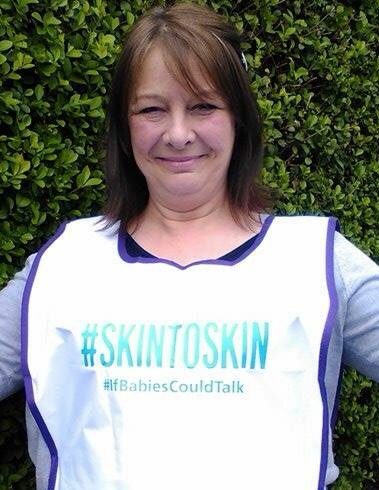 My dream is 100% skin to skin but reality bites and that’s not always possible – however I see the positive in the fact that women and families are more aware of skin to skin and that every day all health care professionals across the NHS are making a difference one woman and one newborn at a time . Their care and love spread the effect and importance of skin to skin on a global level. Theatre staff should be debriefed on the immeasurable ‘stuff’ like the woman’s heart overflowing with love , the tenderness that is shown , the noise in theatre turning into silence for the mother and child as they provide a two way comfort for each other . These things slip away unnoticed by some staff and it’s so sad that some are impervious to what’s actually happening . A life is beginning -a relationship is starting – a caesarean birth is not a ‘procedure’ but an amazing event bringing a child into this world to be protected valued and rejoiced. So I’ll say this – let us all talk about love and birth as a partnership – let’s know why skin to skin must happen and promote it more , let’s be ready for it ,prepare women for skin to skin , stand by them , give women the ability to believe in what skin to skin does by enabling women and newborns to experience skin to skin at birth by caesarean. 2. Prepare the woman by keeping one of her arms out of her theatre gown and tucking it under her arm – an off the shoulder look which has a special purpose = gives space to the newborn . Place the stickers for the ECG connectors on the woman’s back – ask the anaesthetist for support and explain why.